On October 16, 2017, astronomers excitedly reported the first detection of electromagnetic waves, or light, from a gravitational wave source. 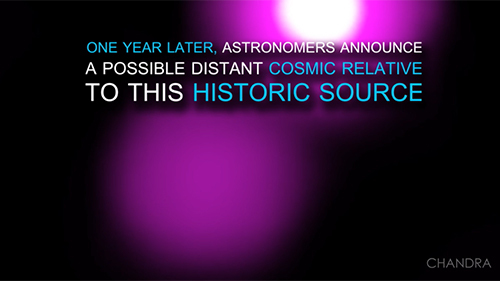 Now, a year later, researchers are announcing the existence of a cosmic relative to that historic event. The discovery was made using data from a host of telescopes including NASA's Chandra X-ray Observatory. The object of the new study, called GRB 150101B, was first reported as a gamma-ray burst detected by Fermi in January 2015. This detection and follow-up observations show that this new object shares remarkable similarities to the neutron star merger and gravitational wave source discovered by the Advanced Laser Interferometer Gravitational Wave Observatory, and its European counterpart Virgo in 2017 known as GW170817. The latest study concludes that these two separate objects may, in fact, be related. 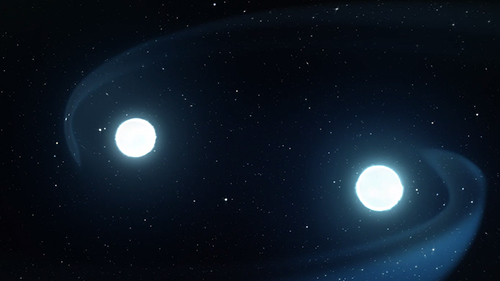 The researchers think both GRB 150101B and GW170817 were most likely produced by the same type of event: the merger of two neutron stars. This is a catastrophic collision that generated a narrow jet, or beam, of high-energy particles. The jet produced a short, intense burst of gamma rays, a high-energy flash that can last only seconds. This was followed by an afterglow in optical light that lasted a few days and X-ray emission that lasted much longer. Scientists think both of these events involved kilonovas, that is, powerful explosions that release large amounts of energy and can produce elements like gold, platinum and uranium. Understanding these explosions helps astronomers trace our cosmic ancestry. There is still a lot to learn about these events, but Chandra is poised to help in this new era of combined gravitational wave and electromagnetic investigations into our Universe. On October 16, 2017, astronomers heralded the exciting discovery of a gravitational wave source that also was captured in different types of light. Now a year later, astronomers have found a possible distant cosmic relative, called GRB150101B, to this historic source. 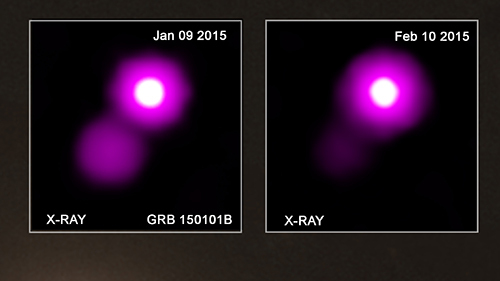 Originally discovered as a gamma-ray burst in January 2015, GRB150101B was observed by many telescopes including Chandra. These data show that GRB150101B possesses remarkable similarities to that historic object announced a year ago. If confirmed, this discoverymeans there could a new, relatively common class of erupting objects that turn on and off in X-rays. This animation shows the shrinking orbit and explosive merging of two neutron stars, immediately followed by the eruption of powerful jets (red) and then expanding shock waves where the jets plough into surrounding material (pink structures at the tip of each jet). The animation then shows the kilonova, the neutron rich debris of the explosion (depicted by the expanding and flattened blue spheres) powered by the decay of newly forged radioactive elements. The jets emit gamma rays, the shock wave glows in X-rays and the kilonova produces ultraviolet light.